KJIPUKTUK (Halifax) – Yesterday afternoon well over a hundred people turned out for a rally and march, to support of refugees and migrant workers, and to let Halifax know that racists and Islamophobes are most definitely not welcome in our city. 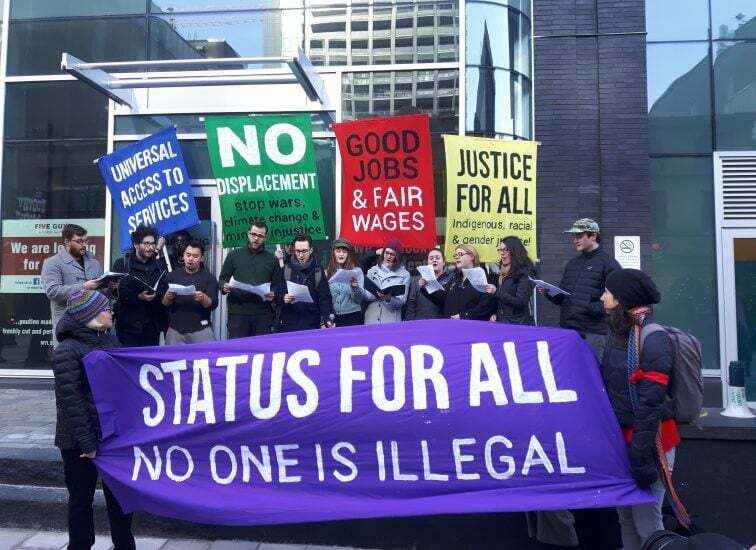 The rally started in front of the Convention Centre on Argyle Street, the location of the large National Metropolis Conference, attended by researchers, policy makers and members of the immigrant community. Both Elder Billy Lewis and poet and educator EL Jones reminded attendants that the International Day for the Elimination of Racial Discrimination, the immediate occasion for the rally, is observed annually because on March 21, in 1960, police opened fire and killed 69 people at a peaceful demonstration in Sharpeville, South Africa against the apartheid pass laws. “Often these occasions turn into something fuzzy, and we forget why we’re here, which is because of state violence, and because of laws that gave one group power and made another group second class citizens, who have to show papers to move around their own country,” said Jones. EL Jones went on to remind people that so-called illegal immigrants end up not in shelters, like no doubt many Nova Scotians assume, but in jails like Burnside, just across the harbour, for months on end. “These are the kinds of things that happen when we say that the state has the right to take somebody’s freedom just because their body moved from one place to another. Not because they committed a crime, but because they are what is called illegal,” Jones said. Masuma Asad Khan, an activist who tirelessly calls out the racism and Islamophobia that is so prevalent in our province, performed a spoken word piece inspired by the terrorist attack on Muslims in New Zealand. “The problem is that slavery has not really ended. It ended in history, but in reality it continues. Every day workers who came here from other countries do the work that Canadians don’t want to do, and they do so for less than minimum wage, and under deplorable conditions,” said Noe Arteaga, a migrant worker organizer. “There are still workers who are made invisible. This is something we need to work on day after day, and that work starts by knowing and understanding the conditions these people face,” Arteaga said. After the speeches the group marched through downtown Halifax to Pier 21, where some of the National Metropolis Conference events are taking place. More people spoke there, but unfortunately I couldn’t join the group there. With racism on the rise, the rally was timely. 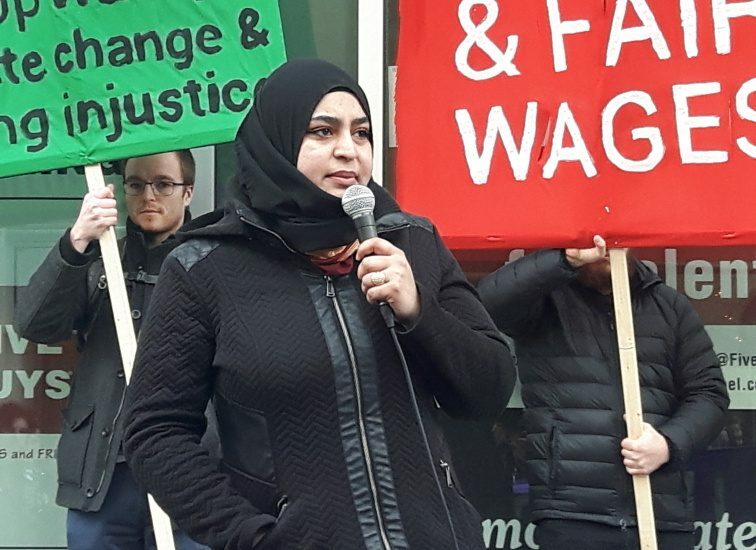 What’s significant is that it was the result of efforts by many Halifax groups active in the fight for social justice, organizer Stacey Gomez told the Nova Scotia Advocate in a phone call this morning. “It is really important that the action had a broad base of support. The key demands are status for all, access to services for all, and and end to factors that cause displacement,” says Gomez. 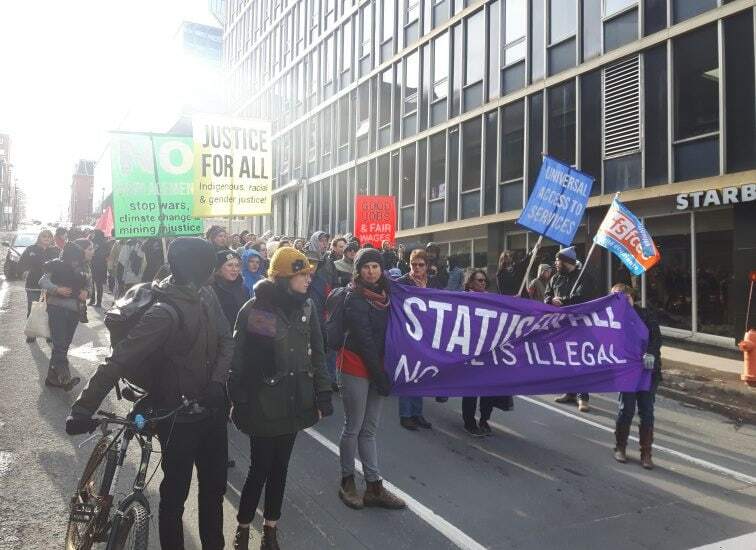 “But we wanted to send the message that migrant justice also means justice for all marginalized people in our community, contrary to the far right anti-immigrant rhetoric of politicians and groups. Justice for migrants is justice for all. That’s why the Fight for 15 people were there, and people standing for gender justice, and against racism, including Islamophobia,” Gomez says. A similar coalition is taking shape at the national level, through the newly formed Migrants Rights Network. The coalition includes local groups from across Canada, but also two national unions, Unifor and CUPE. Building on the work we did in the run up to yesterday’s rally we are now talking about next steps, Gomez says. Stay tuned for an event on May 1, International Workers Day, with other events in the works as well. The federal election later this year is also on the coalition’s radar.